In 1977, in Abood v. Detroit Board of Education, the Supreme Court ruled that government employees who do not belong to a union can be required to pay a fee – often known as a “fair share” or “agency” fee – to cover the union’s costs to negotiate a contract that applies to all public employees, including those who are not union members. The justices reasoned then that allowing the fees would help to avoid both labor strife and the prospect that nonmembers could be “free-riders” who benefit from the union’s collective bargaining efforts without having to pay for them. Anti-union right-wing organizations have been aggressively trying to overturn this precedent in recent years, with Harris v. Quinn in 2013, and Friedrichs v. California Teachers Association in 2015. In both cases, the precedent of Abood was sustained. In Friedrichs, however, the conservative justices actually invited plaintiffs to try again and bring another case. The third time was the charm. For the second time this week the conservative majority of the U.S. Supreme Court overturned a long-standing precedent, rejecting its doctrine of stare decisis, to effectively say “the law is what we say it is.” It was a foregone conclusion that the conservative majority would rule in favor of a “free-rider” who did not want to pay dues to his AFSME Union, in their never-ending quest to destroy public unions. Justice Alito wrote the opinion for the conservative majority in a 5-4 decision in Janus v. AFSCME (.pdf). The short summary of Justice Alito’s opinion: The Court holds that union fees violate “the free speech rights of nonmembers by compelling them to subsidize private speech on matters of substantial public concern. The Court holds that stare decisis does not require it to sustain the court’s decision in Abood, upholding similar union fees. Alito argues that there are “very strong reasons” not to follow Abood. “Fundamental free speech rights are at stake.” Alito says Abood was poorly reasoned — even though this precedent has been sustained several times. Alito says that non-member employees must opt-in to payment of union dues rather to opt-out. In footnote 6 of the majority opinion, the Court suggests that Unions could be allowed to charge nonmembers for representing them in grievance proceedings. So what are we talking about here? A charge for service fee system rather than the simple straightforward payment of dues? This decision is limited to public sector unions, because the First Amendment only constrains the government. But weakening the public sector unions, which are the strongest of the unions, will further erode the private sector unions as an economic consequence. 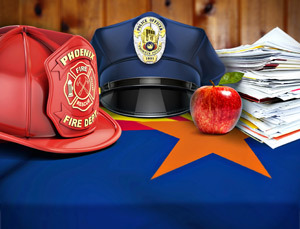 It is important to note that the “First Amendment” interest actually asserted here is that conservative Republican or Trumpkin non-member employees working under a collective bargaining agreement for a public sector union did not want to pay dues on the theory that this “subsidizes” public employee unions in their political activities, which tend to support the Democratic Party, although law enforcement and firefighter unions have tended to support the Republican Party. My guess would be, based upon how these public employee union political action committees (PACs) have spent money on campaigns in the past, the loss of PAC funds may hurt Republicans more in local, city and county races, but it will have a far greater impact on Democrats running in statewide and congressional races. I would have to see more data to better gauge the effects, but the intended effect is to defund union support for the Democratic Party. This is a big effin’ deal for union membership and our politics. I will have more on this later. Good unions do not need agency fees. When I was a cop, union membership was voluntarily and there was no agency fee. Of about 1,200 cops, only 1 did not join. That 1 was not me, by the way. All but 1 joined because we had a good union.